Benjamin Franklin once said, "There never was a good war, or a bad peace." He obviously never had a chance to play Advance Wars: Days of Ruin, or else he might have changed his tune. Days of Ruin (or Dark Conflict, for our European readers out there), was released in early 2008 for the Nintendo DS. It is the 12th entry in this long-running Intelligent Systems developed series of wargames, though it is just the fourth such game to receive an English localization. While each of the first three Advance Wars titles featured bright, lush visuals and somewhat lighter, anime-inspired story lines, Days of Ruins eschews that in favor of a darker, grittier approach to things — which suits this gamer just fine, seeing as how the fine turn-based strategy gameplay is still intact. As the game opens, the player is informed that the world is in bad shape. Meteor showers have reigned down upon the Earth, killing roughly 90% of the population and creating massive destruction in the process. Things look bleak for the survivors, who are running low on food and other supplies. Against this backdrop, we meet Will, a trainee cadet with the Rubinelle military who managed to survive the incident and escape from his academy. While he is looking for help, he is attacked by a group of bandits and rescued by two members of Rubinelle’s 12th Battalion, Brenner and Lin. They also rescue an girl who has amnesia, dubbed Isabella by Will, and they eventually work together to stop not just the marauding bandits, but also to stop the outbreak of a global conflict between nations. There are many twists and turns throughout, and I thoroughly enjoyed the more mature setting and plot development. Of course, the quality of the story is essentially meaningless if the game isn’t enjoyable enough to make you want to see it through to the end. As mentioned above, this is a turn-based strategy game, and unlike many other titles in the genre, it contains few if any RPG elements. Essentially how it works is that after each story sequence, you will be taken to a battlefield map and given a starting army of varying sizes. Each turn, you can move your troops, attack and attempt to take control of different locations with certain types of soldiers. Controlling towns gives you increased income and the ability to retreat troops there for rest, while seizing factories allows you to build new units and increase the size of your attack or defense force. Also, your commanding officer or C.O. also will eventually gain the ability to influence the outcome of a battle with their C.O. powers, and on occasion visibility will be limited thanks to something known as Fog of War. There are 26 main missions in the game’s Campaign Mode, as well as several unlockable missions as well as both local and online multiplayer matches for up to four players. Furthermore, the game allows armchair generals to create their own battlefield maps and upload them via the Nintendo Wi-Fi Connection. 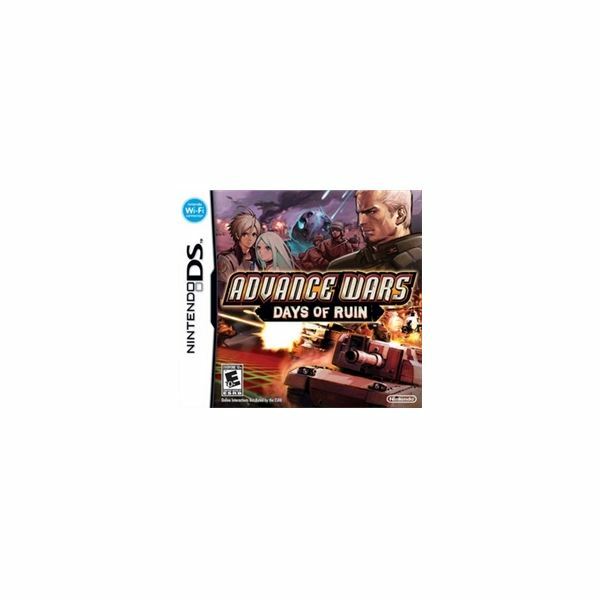 Advance Wars veterans should know that Days of Ruin is definitely an improvement over the already solid Dual Strike, the previous DS entry in this series. Fortunately, Days of Ruin does away with its predecessor’s C.O. Tag Powers, which made the game too unbalanced in my opinion. This time around, C.O. powers are far less influential in battle, which forces you to rely more upon your own tactical acumen, which is as it should be if you ask me. Also, there are new units featured in the game, and if a unit wins a battle, it "levels up" and increases in power with each of its first three victories. These additions and changes help make this the definitive Advance Wars experience. In keeping with the darker tone, Days of Ruin does away with the anime-inspired C.O. portraits and the bright, almost pastel colored landscapes are gone. Replacing them are more artistic character designs and more low-key artwork all around, especially during cut scenes and battle animations. Likewise, the music is more epic and somber in tone than previous Advance Wars games. The added emphasis on realism and the crafting of such a desolate world definitely helps advance the narrative, and its more visually striking as well. Still, it’s not perfect. The units and the battlefields are especially problematic, because the graphics in these areas really haven’t gotten any larger, clearer or better defined since the days of the original Advance Wars — despite the fact that it has been several years since the series’ U.S. debut and the added processing power of the DS hardware. Even the Pokémon games have received some noticeable upgrades in terms of graphics and presentation in the switch over to Nintendo’s dual-screen handheld. Why hasn’t Advance Wars? Despite a few flaws here and there, and despite my personal preference for the gameplay style of another Intelligent Systems developed strategy series (Fire Emblem), I really enjoyed Advance Wars: Days of Ruin. I’ve said it countless times throughout the review, but it bears repeating again that the darker, more realistic and more mature tone really hooked me. The graphics and writing are definitely better, and the gameplay is more strategic than other recent games in the series, thanks to the tone-downed C.O. powers. Plus the online multiplayer options give this game almost infinite replayability. This really is the best Advance Wars game yet, and well worth purchasing if you consider yourself a fan of this type of game.